9 percent larger as the result of better yields. favorable, and the winter wheat condition as satisfactory. pected to result in oven higher foreign prices in 1937-38 than in 1936-37.
offset by higher world prices. by early harvested new crop wheat, will continue to be a strong market factor. will begin moving within another month. to be below 100 million bushels. demand aiid the smallest supplies in recent-years. acreage in the United States 2/. area har' cstcrd i.n 19_..
wheat acreage in the United States and C~.nado. 2/ See page 5 relative to United States acreage. compared with 8.9 million acres in 1936.
bushels. The final estimate for 1936 was 127.8 million bushels. Compiled from official sources, -::cept as otherwise noted. iJ/ Winter acreage remaining; for harvest. / Area sorn up to January 1. 51 Estimated. in the Belgrade office of the Bureau of Agricultural Economics. G/ Area provided for in the Plan. Saskatchewan and northern Alberta .precipitation has been normal or above. 94 compared with 90 on the same date a year ago. other parts of Europe, warmth is needed; some areas report excessive moisture. continued dry spell is causing some concern as well as grasshoppers. figures for recent years are shown in table 14.
to small remaining stocks they fell off sharply during April iand early May. month were larger than in any similar period since 1931.
of other grain and foreign matter. that country during th.- current season have'amounted to only 88,000 bushels. tight situation would have prevailed in some countries. tables 10-and 11, and 15 to 17.
at Chicago, Kansas City, and Minneanolis are shown by weeks in table 2.
prospective size of the 1937-38 world crop. on available supplies an3 import requirements by countries. 2/ Domestic prices are discussed on page 8; see also table 13. 1/ Conversions at noon buying: rote of exchange. 2J January 1 to date. 3/ June and July futures. 1933 they reached the record peak of 378 million bushels. stocks to 138 million bushels by July 1, 1936.
above t e acreage harvested in 1936.
considerably above normal during April. July-December period was placed at 414 million bushels 1/. to be below 100 million bushels, and probably only about 90 million bushels. IJ "The Theat Situation", February 1937, agoe 5. 7/ See table 9 for details and notes. prices in selected foreign as well as domestic markets. 1/ weekly average of daily cash quotations, basis No. exports in significant quantities possible in 1937-38.
supplies of old crop milling wheat remaining in this country. 1/ Price of parcels at Liverpool not available. 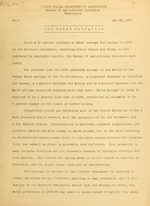 War, acreage was increased and large exports followed. crop in Canada on April 30 was reported as 82 compared with 94 a year ago. percent in the planned rye acreage compared with last year. ports an abandonmcnt of 4.2 percent, leaving 10 million acres for harvest. year. The acreage in Poland is reduced about 1 percent. Belgrade office of the Bureau of Agricultural Economics. Includes mestin. hj Area provided for in the Plan. stocks of 15.8 million bushels on July 1, 1936, totaled 2 '.2 million bushels. earlier and 9.7 million bushels in 1935.
shipments. Shipments from Black Sea ports continued at relatively low levels. they rose again, reflecting dry conditions, principally in Nebraska. L_ Buoreau of the Census raised to represent all merchant mills. I/ 1923 to 1926 Bradstreets, -xcl-iding; country elevator stocks. 1930 to date, Bur, a of Census raised to repr-'crnt all merchant mills. 4/ Revised on the basis of the 1935 Census of Manufacturing. flour wholly from United States wheat. December 31, 1934 included with domestic exports). 4/ For individual items see supply section. * 9 0 ... .
2/ Includes wheat for grinding in bond for export, which enters duty free. production and stocks in Russia and China. by Statist Index (1910-1914 = 100) and converted at par. 3. 3 3 .. 3 .
are converted to United States money at the current rates of exchange. 1/ No. 2 Hard Winter. 2/ No. 1 Dark Northern Spring. No. 1 Heavy for week ended February 6. 3/ No. 3 Manitoba Northern. 5/ Home-grown wheat in England and Wales. 6/ Central German wheat, wholesale trade price free Central German Station. port stocks and stocks afloat, May 1, 1934-37 1! :1il. bush. Mil.. bush. I.'il. bush. !.Iil. bush. Compiled from Broonhall's Corn Trade News. Fort William, Port Arthur, Vancouver, Prince Rupert, and New Westminster. Co:-.ilede from: official sources, cxcent ns otherw.-ise stated. 3/ Less than 500,000 bushols. -4/ ,]t ex-'orts of less than 500,0r, bushcls.